What is happening in Israel? 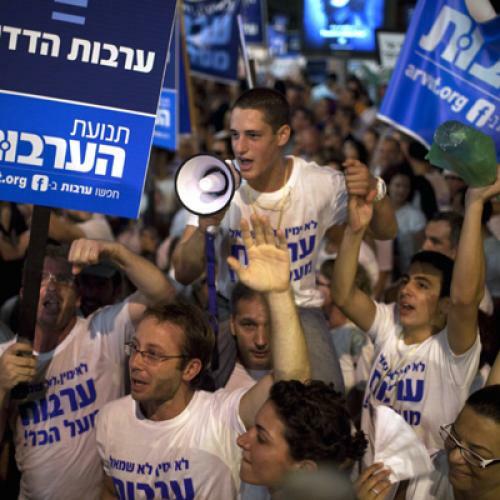 As usual, no one expected, no one predicted, the massive uprising of Israel’s young people—joined last Saturday night by large numbers, amazing numbers, of their parents and grandparents. What started as a demand for affordable housing has turned into something much bigger. I can only watch, and cheer, and try to figure out what’s going on. Here are four “takes” on the uprising. This is a rebellion of the mainstream against the privileged sectors—most importantly, though few will say it, against the settlers and the ultra-orthodox. Proportional representation makes it possible for relatively small groups of bloc voters to achieve disproportionate power, and these two groups, as key participants in (mostly) rightwing coalitions, have won benefits available to no one else. As one Haaretz columnist wrote, Netanyahu is a socialist in the occupied territories, where a fully developed welfare state exists, though only for the settlers. The settlers now include many ultra-orthodox Jews—who have been pulled into the nationalist camp by the gift of housing for their large and growing families in the territories. In the early years of the state, the ultra-orthodox had no politics beyond the demand that their children be exempt from army service and that their way of life be subsidized by the state. Given this, they were as ready to join the left as they were to join the right. Now, they have been decisively incorporated into the right. All this comes at the expense of the Israeli mainstream—of all Israelis, really, who live and work inside the Green Line. And who want to live and work inside the Green Line: They won’t be moved by the argument of rightwing members of the Knesset who say that there is plenty of cheap housing in the territories—the protesters should go there. This is the first uprising, anywhere in the world, against a successful neo-liberal regime. Israel’s macro-economy is doing very well (I make no predictions about what it will do tomorrow): unemployment is low, the shekel is strong, foreign investors are interested, there is a lot of entrepreneurial energy, and economic growth is substantial and steady. At the same time, the damage that neo-liberal policies do to communal solidarity, to welfare provision, and to the maintenance of the public sector is visible everywhere in the country (except in the occupied territories), and it is increasingly difficult for many families, with two wage-earners, to achieve and sustain a decent life. So this is a rebellion whose motto might be: It’s the micro-economy, stupid! But its actual slogan is: The people demand social justice! There is no crisis here of state indebtedness, or of inflation, or of unemployment. The crisis has to do with inequality and injustice, and the people marching, who may well turn out to disagree about many things, seem to agree about that. The uprising is a collective effort to escape the constraints and divisions of the Israeli debate about security, the nonexistent “peace process,” and the occupation. When the emerging leaders of the uprising insist that their protest is “non-political,” they mean that it’s not about war and peace. They know, of course, that everything is connected and that the difficulties they are experiencing are partly caused by massive state investment in the occupied territories. But they have their own dream of Zionist normality: They want to focus on their own lives and on the quality of domestic society. One can see the focus in their signs and placards. In the old Peace Now demonstrations, there were many signs in English, and this made perfect sense: The message of the demonstrators wasn’t aimed only at Israelis, but at Arabs, Europeans, American Jews, and Americans generally. But, in these demonstrations, all the signs are in Hebrew. The people of Israel are talking to each other. This is a protest against what Israel has become, in the name of what it once was. It is an effort by the youngest Israelis to recapture an older, more egalitarian, more idealistic, country that their parents lost. This is the view of the uprising that, with all my heart, I want to be the right one. Or one of the right ones, for no protest of this size can be so easily summed up. But there were some wonderful moments in the past week that suggest the pull of the old Israel. Late one night, my wife, some friends, and I walked up and down the kilometer-long tent city in Tel Aviv, and we came upon a group of about 100 or 150 people gathered around a folk singer with a guitar, singing songs from the 1940s. No one sings those songs anymore, my friend whispered to me. But there they were, a mixed crowd of old and young, singing, their faces shining, about a country and a time that they wanted to remember and celebrate. They weren’t longing for the poverty of that time, but for the solidarity. In the Jerusalem march a week ago, we found ourselves walking alongside a crowd of teenaged kids from Shomer Hatza’ir (The Young Guard—a name from another era). I had thought the organization long gone, but there were a lot of young guards, marching, and chanting, “The people demand social justice!” They were also wearing, my wife said, the same blue blouses that she wore when she was a young guard in the 1950s. Together, their age and ours (and there were lots of others like us) say something about the meaning of the demonstrations. For a while, we told anyone we met that we were just spectators. But that wasn’t true. We would have marched in a demonstration like this anywhere in the world—and here, we knew all the symbols and many of the songs. No one knows what will become of all this; no one knows how to turn a festival of protest into an effective politics. There are many obstacles, including the old politics of war and peace. But the despair of a month ago, the sense that the left was dead, the belief, repeated again and again, that a whole generation of Israelis had turned away from political action in search of the pleasures of private life—all that seems gone. This is a time of unexpected hopefulness. Michael Walzer is a contributing editor for The New Republic and professor emeritus of social science at the Institute for Advanced Study.